Only took me 7 years to finally do one! Pleased with the result though; 176.2bhp @ 7105rpm & 144lb ft at 5700rpm. Been a while since I last read about anyone hitting the rollers on here, be interested to know what they pulled and what sort of curve they made. I'll scan my graph in when I can. Last edited by Kitch on Sun May 15, 2011 8:48 am, edited 1 time in total. I know you rebuilt your motor a while back, what else have you done to get that healthy result? Well that's just it, not much really! It's got that mickey mouse chip on it still (which was doing some mad things with the fuelling! ), a cone filter, lightened/balanced bottom end, fancy plugs/leads. I'm planning to do a compression test soon too as I have a feeling the head's been skimmed to raise compression. It's always felt like the quickest one of the four I've had, but I don't know of any other mods. I doubted it personally, as my car was one of the first to hit the rollers, but as the day went on all the other cars on the day made realistic power, including a Leon Cupra 1.8T which put out 177bhp and a Fiat Coupe 20v Turbp with 231bhp. A TVR Chimaera 5.0 also put out 286bhp, having netted 306bhp six months earlier at the TVR RR day I went to with mine, and that was at Surrey Rolling Road, one of the most accurate around. There are theorys floating around about it already, as the BX was the result of the day for most (as most didn't realise they had as much as 160bhp anyway!) but the main thought is that with the 2005 rebuild with new piston rings, de-glazed bores, all the balancing work on the bottom end, the cleaned out head and new seals/gaskets, it's possible that engine has optimum compression as it would new, but is much more free and looser due to the miles it's covered. 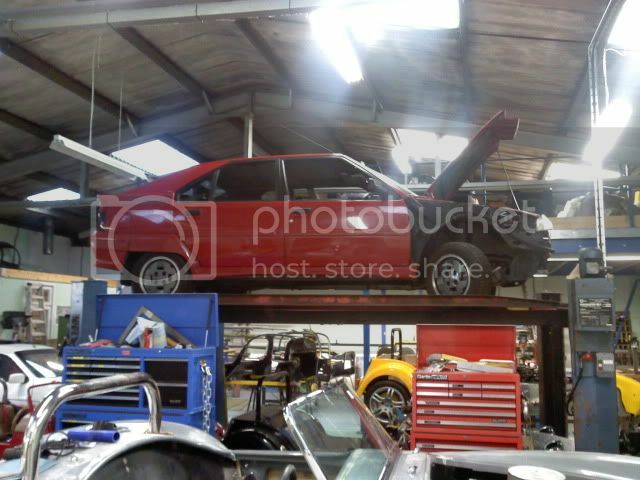 Jezziebx16v wrote: Done at Regal Motorsport? Yeah Regal. They're Vauxhall tuners, but seem to get involved with Porsche 997's alot now too randomly. bet your dead chuffed with that! i'd be over the moon if mine was even close to original spec lol! time to star he dream of the garage with 4 poster ramp and own personal RR again! haha!! Well, yeah, really happy if that's the case. I'm not totally convinced by it yet. It is actually the quickest 16v I've driven, but I struggle to see how it would pull that much with the few things I've actually done to it. Had a rolling road day recently and a good day was had by all. Pretty much all the results posted (bar one or two in my opinion) were on the money, with standard cars producing the same, if not slightly less than OE quoted figures. I understand flywheel BHP figures will only ever really be an estimate, even if it's a very educated one. 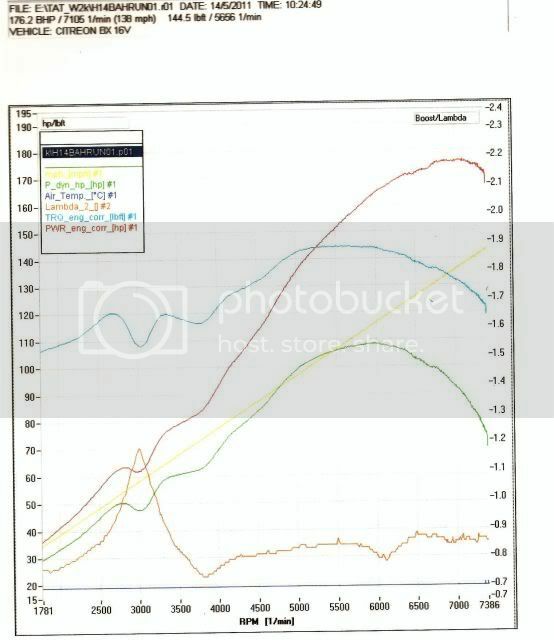 This is a scan of the printout from my own car's run, a 1991 Citroen BX with an n/a non-VVC 1.9 DOHC engine (as found in the Peugeot 405 Mi16) running a Bosch Motronic MP3.1 ECU setup. I'm wondering if there any R/R gurus who might be able to help my decifer some of it and offer their opinions. 1) I'm interested to know what sort of characteristics the graph shows the engine has. Seems a bit odd I know, but I'd be interested to know what good and bad points others who may not be familiar with the engine can spot as my own view is clouded by knowing how the car actually drives! It stinks of fuel around 3000revs for example, but I spotted the obvious reason why. There may be many other subtle clues as to the engine's health hidden in there that I'm missing. 2) My car's original quoted power is 160bhp in the books. Obviously I'm showing 176.2bhp here, yet the engine is not really tuned. It's running a chipped ECU (always questionable of it's worth by most), a cone air filter (physically pulls noticably harder with this on) and the engine was rebuilt by me in 2005 with new rings and big ends, honed bores and a full clean and de-coke. It's always felt like one of the quicker ones I've had (I've owned 4 different cars) but these engines are normally considered difficult to extract power from without waving big bucks around, rather than 20bhp from an air filter. I've always assumed mine was healthy and the other 3 not so. I've read some cars are over quoted new *coughTVRcough* and some are under quoted for insurance reasons, or to avoid competing with another car of the same model etc. But I can't imagine Citroen doing that with the BX, seeing as they were competing with Renault who were about to launch the 21 Turbo which had 15bhp more with it's turbo engine. PSA made a point of developing this twin cam engine which was apparently better than a turbo charged equivilent, so I can see tham over quoting if anything. However most standard cars I know that have taken to the rollers do seem to make somewhere in the 155-165bhp region. Could the fact my engine is largely run in (118k miles) with good compression and clean ports (and all the things that came with the rebuild) mean it's potentially more free and loose, yet has decent compression result that it's actually more powerful than a new unit? But then that's assuming a manufacturer doesn't run 100 engines in succession in varying states of wear in the development stages, and then take an average BHP figure across all to print? Surely they'd do something like that? 3) The main thing I've noticed is that the wheel horse power seems very low, around 110bhp at most, and this seems to be a huge loss through the transmission if the flywheel figure is to be correct. I believe it was a self calculating rolling road, where the car was allow to run down afterwards and the rollers take the mechanical drag and covert it into numbers to calculate an estimated flywheel figure. Does this figure look wrong to anyone? The only other car I've had on the rollers (a different set of rollers) was my TVR was made 180bhp at the rear wheels, and 230bhp at the fly (est). So this is saying a FWD BX has more drag through it's cheese gearbox than a TVR running a T5 with a prop shaft, LSD and driveshafts? Are there outside influences, such as tyre pressure and tred, gearbox/drivetrain condition etc that have enough of an impact to affect these figures. I'm sure someone will be along to ask "what does it matter?" or something along the lines, but to anyone who's got some knowledge and is listing towards the helpful side of the shore, what do you think? Please don't be afraid to be upfront, I'm not too fussed what anyone thinks of my actual car! Timmo wrote: Great result fella! Oh yeah, 4 poster! Check! but how cool would it be to have a workshop like that in your back garden!! - actually, i think that one is Significantly Bigger than my garden hahahah!